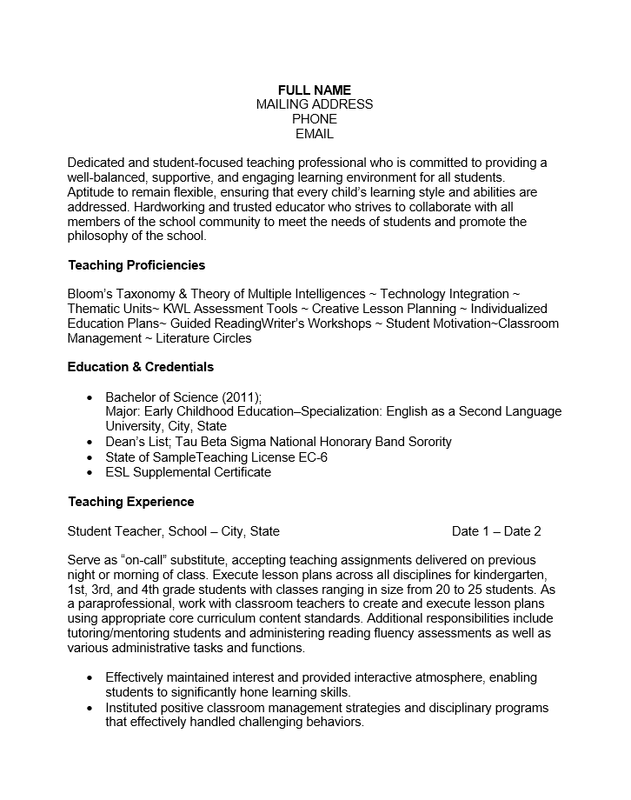 The Experienced Teacher Resume Template is a quick and easy way to present your academic credentials and qualifications when pursuing an opportunity as an experienced teacher. The resume format here is a functional resume combined with reverse chronological resume. This is because one may have to show an impressive set of credentials and skills prominently when applying yet wishes to hold to a currently popular resume presentation. Job hunters who combine these two formats in one document therefore, enjoy the best of both worlds. There is another aspect where the best of both worlds is enjoyed. A resume is one’s introduction to a recruiter and one’s candidacy for an in person interview is largely dependent on this document. It is imperative that the information be presented well and remain specific to the job requirements of the position one is applying for. A template’s goal is to provide a structure or framework to a document that will have to be revised repeatedly. Obviously, keeping a master personalized experienced teacher resume template provides a certain level of preparedness when one spots an opportunity they wish to seize. Utilizing the experienced teacher resume template will enable one to heighten his or her chances in attaining an in-person interview by quickly responding with a well-aimed resume. Step 1. The top of the page must contain your full name and your contact information. Make sure this information is a reliable way of contacting you. It is highly recommended to enlarge your name slightly. Step 2. The “Profile” section is composed of two to three statements to give the recruiter a clear picture of who you are professionally. Step 3. The “Teaching Proficiency” section will be a list of skills, abilities, and experience that has a direct impact on teaching. This list may be presented in any way but must have a crisp professional look to it. Step 4. The “Education and Credentials” section must deliver the degree title you have earned, the year of graduation, the university you earned the degree in, as well as any impressive achievements. This section will also report any specific licenses or certificates earned. Step 5. 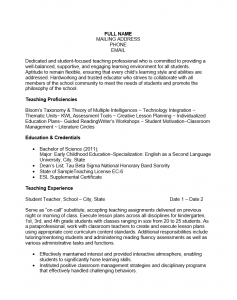 The “Teaching Experience” heading should contain a list of previous employers/positions of the applicant. This should be listed in descending order by date and each employer/position should have its own entry. The entry will need to be comprised of the name of the school/employer, location, and dates employed. The official position title should follow along with a description of what the applicant did there. Step 6. The “Additional Experience” section will detail any previous employment that would have a direct bearing for teaching (i.e. a barista will need to maintain control over a store and the customers regardless of the circumstances). This is briefer than the previous section but more or less follows the same format while leaving out the job description. Step 7. The “Professional Organizations & Community Initiatives” section will give an impression of any extracurricular activities a candidate participates or volunteers in that are relevant to teaching. This should also include any professional networks. Step 8. The “Technical Integrations and Proficiencies” section will contain any technical knowledge (i.e. operating machinery, computer programs, etc).